Our destination today is to enjoy the beauty of the province of Trapani. After a scenic drive uphill and across the countryside, we will reach Segesta. Visit the beautiful Greek temple from the 5th Century BC, perfectly preserved and in Doric style. 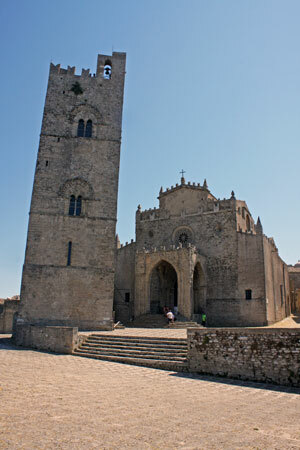 We then visit the medieval town of Erice where we will taste the famous marzipan. After we reach the Zingaro natural reserve where you can stand on the beach to catch some sunshine and back to the hotel. The ancient name of Erice was Eryx, and its foundation was associated with the eponymous Greek hero Eryx. It was not a Greek colony, but was largely Hellenized. It was destroyed in the first punic warFirby the Carthaginians and from then on declined in importance. Eryx was conquered by Aghlebids in 831 and was renamed as Cebel Hamid (In Western sources Gebel Hamed, meaning Mountain of Hamid). It was ruled by Arabs over 3 centuries until Norman conquest in 1167. Normans renamed it Monte San Giuliano. It was known as Monte San Giuliano until 1934. That, at times, are thrown into marked contrast by patches of variegated greens around the excavated aeras. This timeless landscape is presided over by the majestic silhouette of the Doric temple, one of the most perfectly preserved monuments. The road leads onwards to Scopello a small hamlet on the sea dominated by its 18C Baglio (a large fortified building) which faces onto the central piazza. After a bend in the road a dirt road on the right leads down to the old tuna fishery.